Vice-president Leni Robredo will need one hell of an alibi. On 22 December 2016, [GMA] reported that Typhoon Nina (Nock-ten) will hit the Bicol Region on Christmas Day, and that Typhoon Nina is anticipated to become a Category 3 Hurricane. Despite this warning, Vice-president Leni Robredo still decided to fly to the United States the next day [TP: White Christmas] to attend a family reunion “planned more than a year ago,” according to VP spokesperson Georgina Hernandez [Star]. A trip from Manila to the New York, with at most one 4-hour layover, takes anywhere from 20 to 33 hours [Flights], so it’s safe to say that she arrived in the United States on 24 December 2016, Manila Time. By the time she arrived in the United States, she should have known that, Nina has further increased in strength [MB] and she should have also known by Christmas morning that Nina has become a super typhoon with winds of up to 250 kph [Star]. Nina hit Bicol on Christmas night, as anticipated. Despite these dire developments, Robredo decided against going back home, opting to “coordinate” relief efforts through social media [Robredo]. The initial December 23rd GMA report predicted that Nina will become a Category 3 hurricane. When it hit, however, winds have reached 250 kph, indicating that it has become a Category 4 hurricane (Cat4). Alright, hold on one second: Nina is a Cat4 hurricane, so Nina is expected to down power poles so that by extension, it should also disable internet access in large swathes of land. So what reports will the Office of the Vice-president be compiling when the fact of the matter is that those on the ground are unlikely to have access to electricity, let alone the internet? But still, Leni decided to remain abroad. While we have faith in the resilience of our people, we still call on the Filipino public to help out in the ongoing relief efforts of all agencies and private sector partners to alleviate suffering in typhoon-hit areas during this very special time of the year. Alright, there’s another problem here: here is the Office of the Vice-president calling on the Filipino public to help out in the relief efforts, when she herself isn’t there to help them, seriously? It is important for local folks to see their government officials during and right after a disaster. Nina hit Bicol on Christmas day and Robredo was not in Bicol. A day later, she still wasn’t in Bicol. Two days later, she still wasn’t in Bicol. And today, on New Year’s day or seven days later, she still hasn’t been to Bicol. She is still in the United States, despite the fact that flights from the US to the Philippines were available the entire time. Bicol is supposed to be her bailiwick while Naga City, one of the hardest-hit areas, is actually her hometown. How in the world can VP Leni convince herself that attending a family reunion is more important than attending to her own people? What the hell is this woman thinking? Jesse Robredo must be turning in his grave. Is Leni so busy that she cannot even spare two minutes to record a message of consolation for Nina’s victims? The fact that she chose a family reunion over Bicolano evacuees is bad enough. And now, she doesn’t even deem the Bicolanos worthy of two minutes of her time? Is this how Leni interprets her catch-phrase “laylayan ng lipunan” (fringes of society)? This doesn’t make sense. No vice-president can be THAT busy. Can’t she even record a 30-second message while pooping in the toilet? She’s THAT busy? No one is that busy. Even the President Duterte, who is about 20 years her senior and massively busier than her, found the time to visit Bicol. 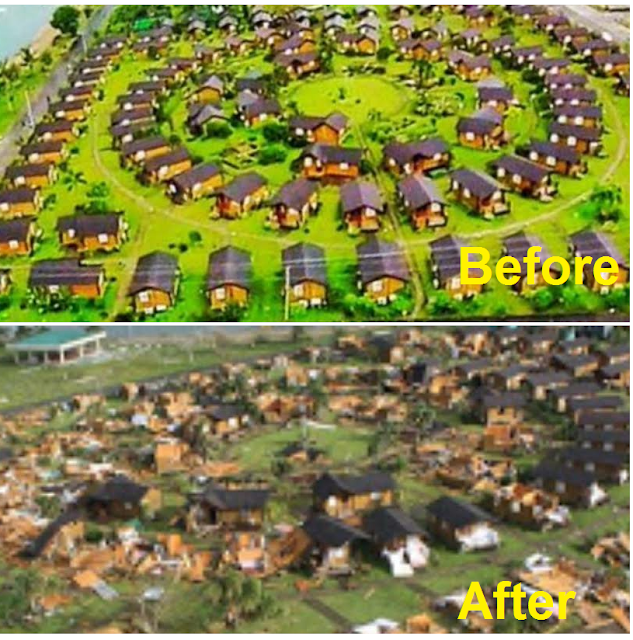 Does even one of the reports Leni “compiled” indicate how much damage Bicol actually suffered? Leni’s indifference is utterly surreal, so much so that there should be at least one intergalactically compelling reason why she is acting this way. Is she too busy plotting an ouster with Loida Nicolas-Lewis [Plan 0117]? Is she too busy with her personal relationships [TP: Frailties]? Is she too busy enjoying the snow [TP: Hypocrisy]? What the hell is she so preoccupied with that a mere two minutes of talk time is too much to ask from her? Yes, it’s been seven days since Nina decimated Bicol, and Leni is still nowhere to be found. With Leni’s absence, I cannot help but suspect that it’s Georgina who’s been making the calls since Christmas day. Yes, I suspect that Georgina has been our “VP” this past week. Poor Georgina, Leni should give her a pay raise for crying out loud! 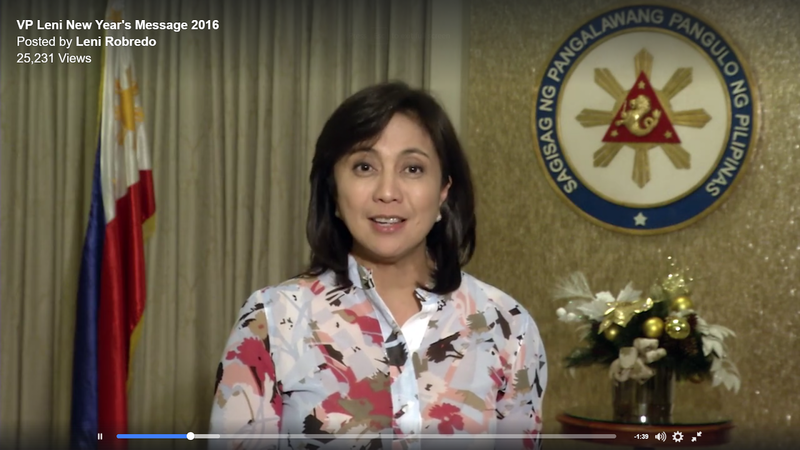 A few Leni supporters went to the ThinkingPinoy facebook page and pointed out that she has finally released a recorded video several hours ago, so I went to Robredo’s official page to check it out. But Robredo knows full well when New Year’s Day will arrive, so it’s easy to pre-record a New Year’s Day message before she flew to the United States. Now, take a closer look at the dress she’s wearing in the recording. It is actually the same dress she wore on 23 December 2016, or a day prior to her departure for the United States. But Leni is known for repeating outfits [Inq], so maybe she just accidentally wore the same thing on different days, right? Well, if she indeed recorded this video after December 23, then it must have been on the evening of December 24th (Manila Time) onwards. She couldn’t have recorded it earlier than that because she was still on a flight. But if she recorded this on the evening of the 24th at the earliest, then she recorded this at a time when she was already aware of what’s happening in Bicol. But there was no mention of Typhoon Nina anywhere in the video. Yes, this newly-uploaded New Year’s Day message was recorded on or before December 23rd. What’s even more hilarious are some of the lines used in the video. Well, the Camarines Sur Sports Complex begs to disagree [Politiko]. Aside from the devastation, Nina also displaced over 380,000 people [Star], all while Leni is getting chummy with family in the United States. Ang taong mga lugmok sa kahirapan ay humihiyaw sa galit, at bakit naman hindi? Sila naman talaga ang dapat pinakikinggan ng ating pamahalaan at nating lahat. Now, how can VP Leni expect the helplessly poor to tweet reports that she will “compile”? How will she listen to them when she’s literally on the other side of the planet? How, just how? Mahalin natin ang simpleng pamumuhay at simpleng kaligayahan. I doubt that a tri-state US vacation qualifies as “a simple lifestyle”. Moreover, preferring to attend a family reunion in the US to attending to poor Bicolanos (who are about to get annihilated by a super typhoon) hardly qualifies as “simple joys”. Do not get me wrong: I have been to the United States myself, but unlike Leni, I never had the gall to promote “a simple lifestyle and simple joys”. The hypocrisy is strong on this Robredo. Palalimin ang paraan ng pagsisilbi sa ating minamahal at lawakan ang ating pang-unawa sa mga nasa laylayan ng lipunan. Well, it appears that Leni doesn’t understand what a “catastrophic hurricane” means, so I doubt that she can ever sufficiently understand the struggle of those in the “laylayan”. Now, it’s interesting to note that Leni awkwardly pronounced “nawa” and “katiwasayan” at the start of her video message, suggesting that she was reading from a teleprompter. Leni, don’t tell me that you didn’t write that yourself. Did Georgina write it for you again? Maybe it’s time to kick you out of your office and let Georgina take over. No, this video was recorded before Leni left for the US. Any self-respecting OVP employee would be smart enough to avoid those lines mentioned above, in light of the Leni’s Year-end PR nightmare. To cut the long story short, the vice-president is still nowhere to be found seven days after a typhoon bulldozed her hometown. Apathy and misplaced priorities are possible explanations, but the OVP will deny both, of course. Instead, OVP should come up with an acceptable alibi for her absence. Personally, I cannot think of any other possible alibi for her except medical incapacitation. Was she suffering from the after-effects of general anaesthesia this entire week? Is she suffering from a condition that we do not know of? Maybe yes, maybe no, but I still look forward to witnessing more of Georgina’s creativity: I want to see what she'll pull out of her a$$ this time.